In North Carolina, handling a “simple speeding citation” can end up being a complex, confusing, time-consuming. . .and sometime frustrating process. It’s worth talking to an attorney and discussing your options. We’re here to help walk you through the process. We see Speeding Tickets and other Traffic Violations as a way to introduce ourselves to you. Maybe we can help you with this citation. We’ll let you know if you can and should handle the citation by yourself, understanding in offering our advice on this matter, you might call us in the future or refer us to a friend or family member for a more serious or complicated legal issue. Few citations are in-and-of-themselves complicated. It is the interplay between the type of citation, the severity of charge or charges, prior driving history, assigned insurance and motor vehicle points, for both yourself and others within your household and policy, that can make deciding what you should do a difficult task indeed. 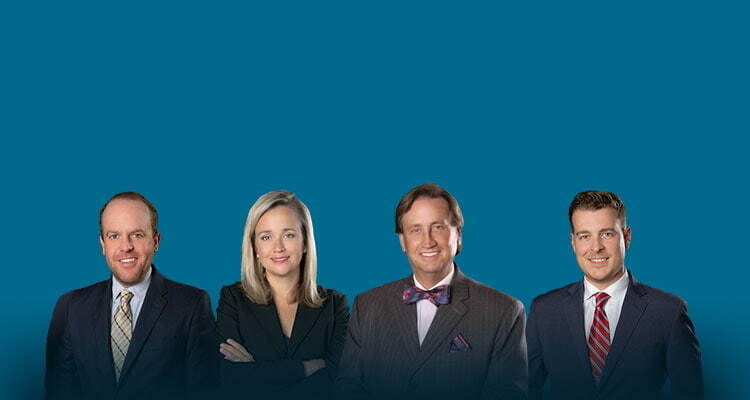 We’d be honored to help explain the legal system to you and why things proceed as they do in different jurisdictions. 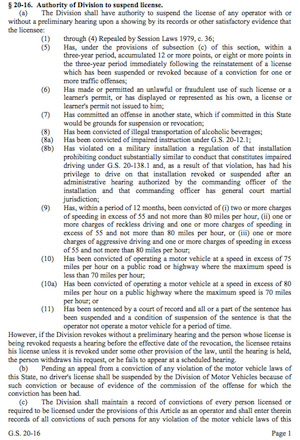 MORE INFO: What Do Lawyers Want to Know About Your Traffic Ticket? Mind you, explaining the law and agreeing with it are not the same time. There are some laws, just like you, we do not think are fair or fairly applied. Our job as attorneys is to help guide you through the system, to provide information, and give you an honest assessment of your different options. We firmly believe good decisions are made after considering, carefully, the different options available to you. In order to do that, we will want to ask quite a few questions. It’s important to consider both your driving history and the factual scenario of the charge(s). Indeed, it’s not all that unusual to encounter multiple charges on a single citation. How to handle more than one matter at the same time is just one of the many factors to review. While related, “points” assessed by the North Carolina Department of Transportation (DOT) – Division of Motor Vehicles (DMV) and Insurance Assessments are in fact different. Some offenses carry differing points values, as set forth with the North Carolina General Statutes and per the North Carolina Safe Driver Incentive Plan (SDIP). 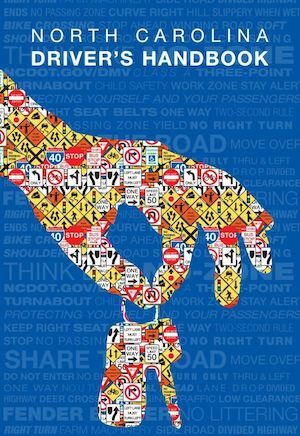 Put simply, it can difficult to understand, as there are different point values: DMV & Insurance for a regular, “Class C” operator vs. Commercial CDL “Class A” or “Class B” licensees. The speed “detected” or otherwise charged, the posted speed limit, and in some instances, the prior record of the offender are important considerations. Normally if you’ve received a Speeding Ticket, the Charging Officer would have issued either a Uniform Citation or eCitation. Again, a lot depends on the type of offense charged. It is important to note SOME non-waivable appearances can indeed be handled in abstentia and/or by way of legal counsel. For the purposes of explanation, an attorney may be able to negotiate a plea to a lesser offense with the State. Furthermore, some jurisdictions (Charlotte-Mecklenburg being one) have what is referred to as an Administrative Court (Courtroom 1130) where an attorney may appear on the behalf of clients to negotiate a plea or otherwise determine a trial setting, if so required. The North Carolina Department of Transportation / Division of Motor Vehicles DMV normally keeps track of convictions, including those for speeding tickets, infractions, and accidents. 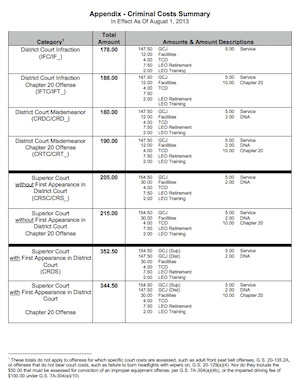 Costs of Court have skyrocketed in the last few years and often represent a substantial percentage of the expense in handling a traffic ticket, speeding citation or otherwise. 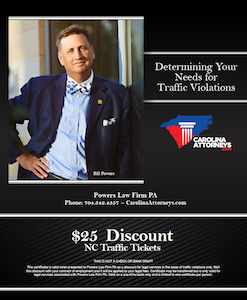 Hey, this is Bill Powers and we have a lot of information on the website regarding different traffic offenses. 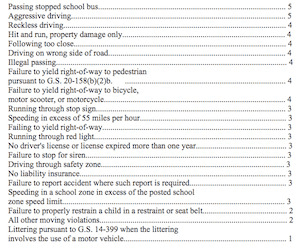 Gosh, I don’t know what is the most common speeding- excuse me, traffic offense. Is it speeding? Is it something else? I would think it would be speeding. It seems like just about everybody does at one time or another, whether it’s intentional or not. We get a lot of questions about it. There are some speeding tickets that, frankly, you should just handle yourself. It’s not financially worthwhile to hire a lawyer, unless you can’t go to court, or have time to do something like that. And that’s great, we are more than willing to help you. I once represented someone whom had had an DOD clearance (Department of Defense clearance) on their way down (from up North) for vacation, not going that far over speed limit, or fast over the speed limit, and got arrested. When you get arrested with a DOD clearance, that’s a big deal. You may be surprised to know, there are some speeding violations in North Carolina where it is within the discretion of the Law Enforcement Officer to decide whether to charge and arrest you. Speeding can carry long term consequences to your license and insurance points, even for cases that you don’t think are all that serious. We have to look at a series of different factors, and it takes a fair amount of ciphering through the record and prior history, and asking a lot of questions, and getting information, to tell you what we think the most appropriate way is to proceed. What have you had in the last three years? Did you go to driving school? Have you had a Prayer for Judgment? Have you had any wrecks? What was the value of the wreck? Did anyone else in your household or anyone on your policy have any of the above? We like to start kind of ticking through things, and then we can say, it’s like an equation, where we’re adding things up. It’s complicated. I’m not making this stuff up. If you don’t believe me, go into General Statutes and look up the Safe Driver Incentive Plan and try to figure out the difference between Insurance Points and Motor Vehicle Points and how they’re together, and how they’re separate. Not defending it, but it’s complicated for a reason, because there’s a million different ways these things can take place. Give us a call. We offer help. That’s why our telephone number is 704-342-HELP. I look forward to hearing from you.